Miami outscored San Antonio 39-12 in the third quarter to stage the BIG COMEBACK WIN after being down by 17, LeBron James went NUTS and turned the game around in the 3Q, while BOSH had another OUTSTANDING night, and lets not forget BIG MIKE MILLER stepping up and making it RAIN 6-6 from 3PT! LeBron JAMES Goes NUTS in the 3Q against the Spurs and turns the game around with THREE 3 pointers and some AMAZING passing! IT was MILLER TIME Tonight!!! Back off his Hernia injury – Mike Miller goes a PERFECT 6-6 from 3 Point Land!! !YEAAAH BOooyYY!! Chris BOSH goes COAST to COAST, Spin Move, and then a MAJOR SLAMMER – Bosh’s BEST dunk of the YEAR – He even sticks the landing this time!! 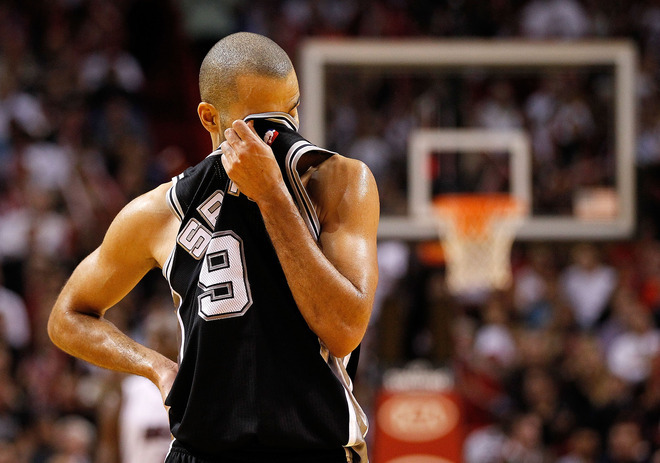 It’s OK Tony Parker, You still go home to Eva! Have a nice trip back! Check out ALL of the HEAT HIGHLIGHTS from last night! Check out the Photos from the S BAR / Don’t Hate Miami – Miami Heat Watch party last night!!! Make Sure to Come Out Thursday vs. The Lakers! Previous article Heat Highlights First 2 Weeks of 2012 Season! Next article Miami Heat BEAT LAKERS 98 – 87 – Eddy Curry Back – The Mamba DeFANGED!